Gu Ma Jia 姑妈家 (Aunt’s House) – There’s no other name as catchy and clever as this one. Just by keeping that name in your mind, you’ll be picturing yourself somewhere kind and familiar, with an unexplainable sense of comfort in your heart. 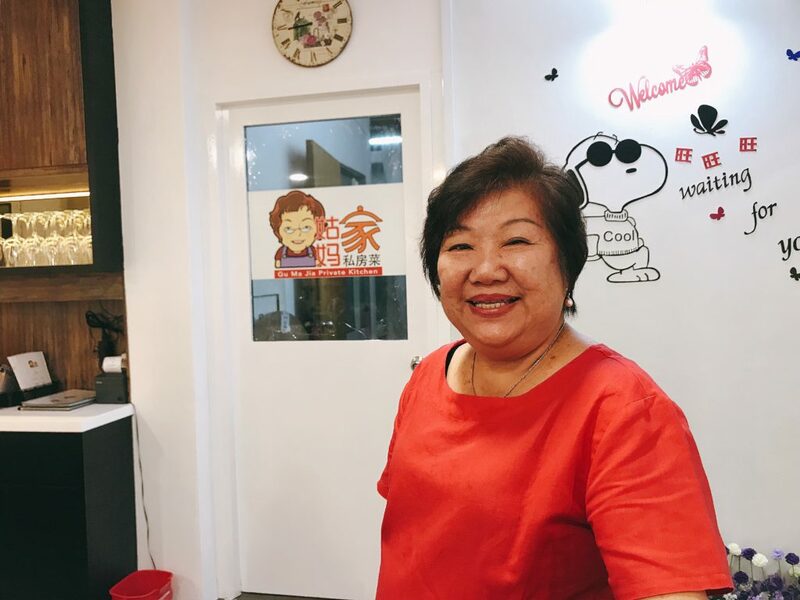 As someone who’s new to this eatery, it was heartwarming and fun to see Gu Ma herself come to life from the iconic cartoon caricature in the Gu Ma Jia logo. Anyways, meet the affectionate and adorable Gu Ma, who actually has a name – Chan Mei Yan. She began her culinary journey when she was seven! What were you doing when you were seven? She finds passion in preparing good food for her family, and having tasted all her delicious dishes, her family members urged her to open her own restaurant. Like a humble little home kitchen, ingredients are bought fresh from the market daily. Her dishes also boast the philosophy of no-MSG, less oil, less salt, and less sugar. 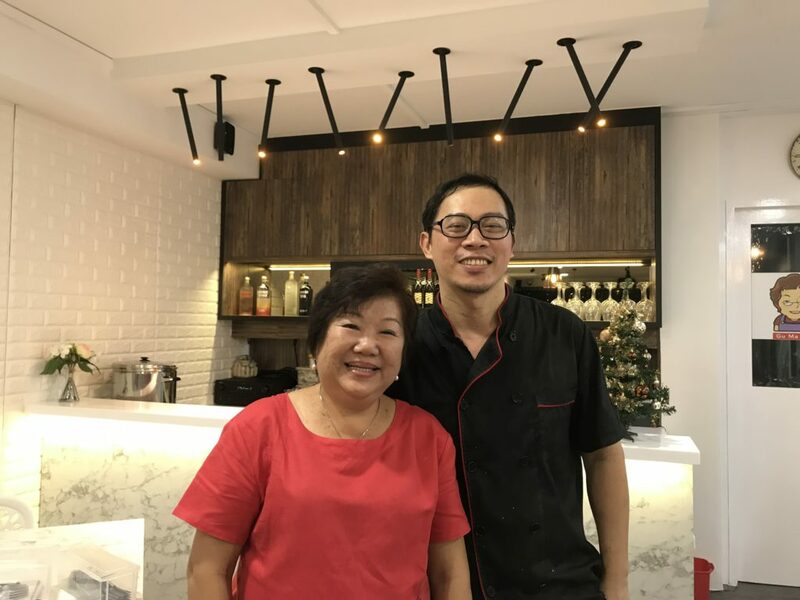 While Gu Ma is not at an age where she’s sprightly enough to be churning out dishes all day, she has the discipleship of Chef Yap, who’s already been following in her footsteps for seven years. 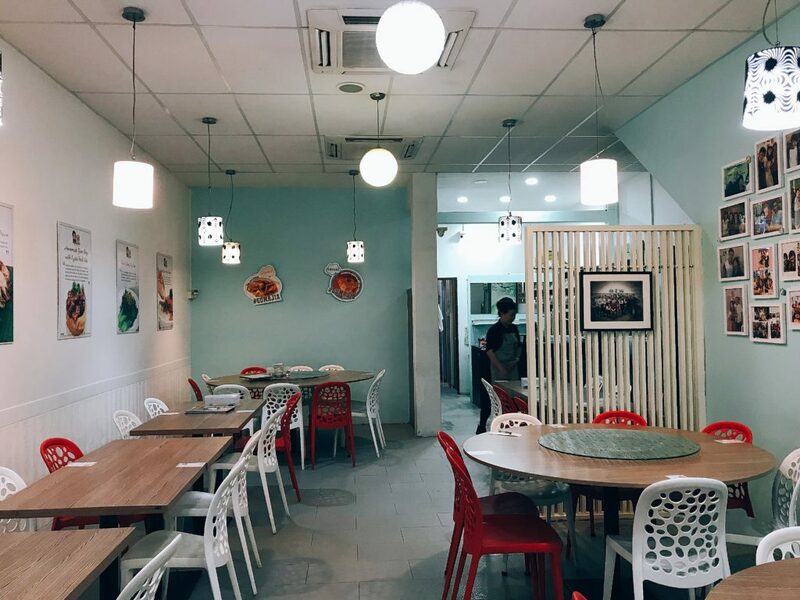 With a touch of contemporary flair, the space at Gu Ma Jia is, as you’d expect, simple and sweet. With walls of baby blue and family photos plastered all over, there’s nothing pretentious here. Nothing screams reunion more than homey dishes, and Gu Ma’s kitchen is ready to whip up whole tables of them for you and your family. Here’s a peek at what you can expect. If there’s one dish that brings a reunion dinner to life, it’s the Yu Sheng. 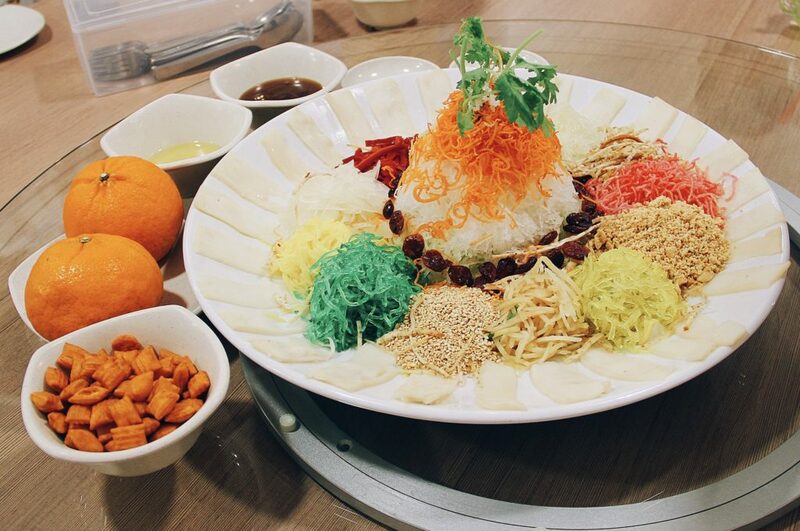 The Prosperity Yu Sheng ($40.80/$50.80) here is served with Gui Fei Abalone and boasts an array of colours. I’m not one for second helpings of Yu Sheng, but this one got me going back for more. The sauces were sweet and tangy, with crunchy vegetables freshly-shredded in the kitchen. 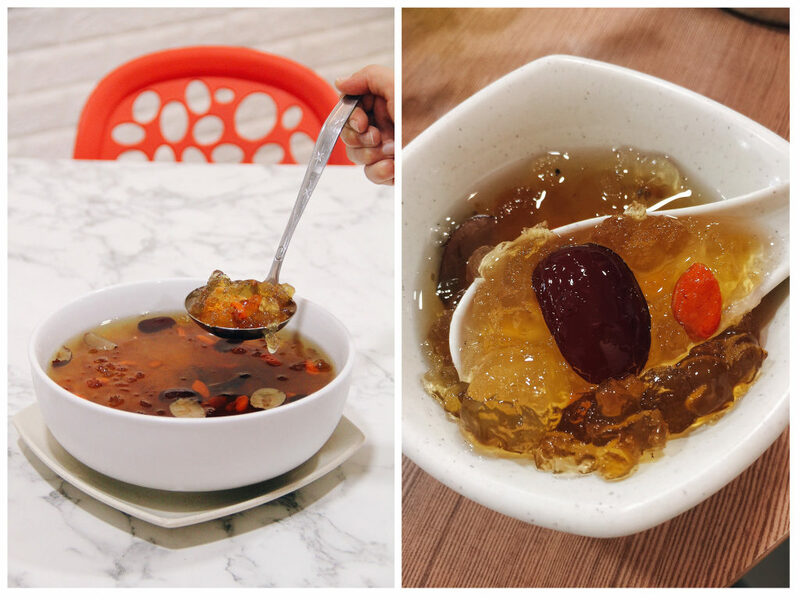 The addition of cranberries worked to balance out the tanginess, a good move by Gu Ma Jia. 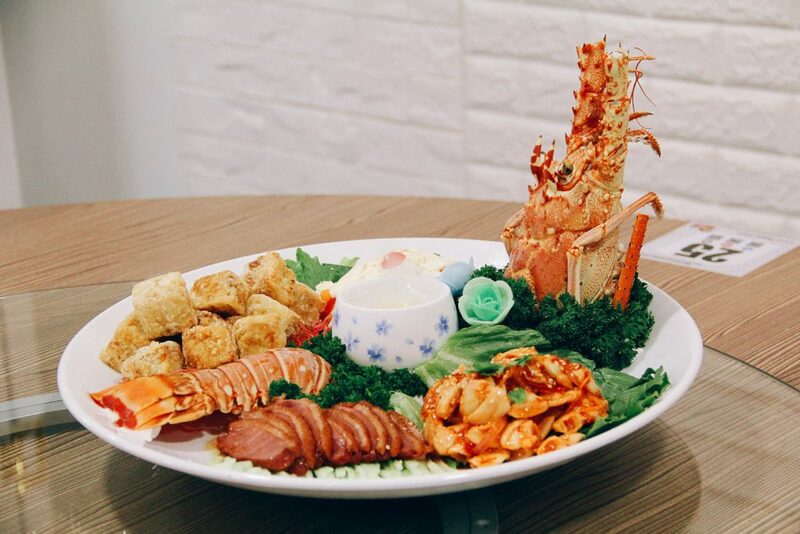 A show-stopping prelude to the feast ahead, the Lobster Cold Platter ($138) features a fresh lobster salad, Mixed Sauce Pacific Clams, Smoked Duck, and Gu Ma’s Special Beancurd. Despite the enticing clusters of expensive ingredients on the platter, my favourite was the Gu Ma Beancurd. Fried lightly on the outside, the bite past the golden cube of crispy skin brings you to this fluffy and soft interior. I couldn’t put my finger on what secret ingredients are used here, but it tasted like a savoury mixture of fish and tofu. 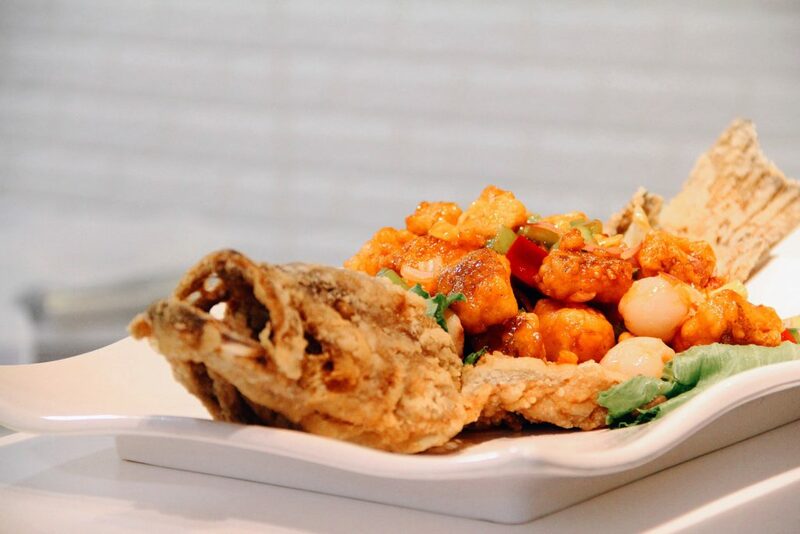 Look past that pair of eyes staring at you, and you will see that the grouper’s body has been replaced by a heap of Deep-fried Sweet & Sour Grouper with Lychee (Market rate). If you have a bunch of kids in your family, this dish will be a sure-fire hit with its refreshing and sweet burst of flavours. You will find chunks of deep-fried tender grouper meat and juicy lychee flesh in the mess, but the combination of sweet and sweet may prove a tad too cloying for adults. For dessert, stay beautiful with the Double-boiled Beautifying Peach Gum with Red Dates($32.80). Peach gum is an edible resin that is exuded from the bark of the peach tree and contains collagen that naturally beautifies the skin. Immersed in a soup that was delicious and cleansing to the palate, the peach gum was smooth and springy. A guilt-free dessert like this is always appreciated, especially for ladies. 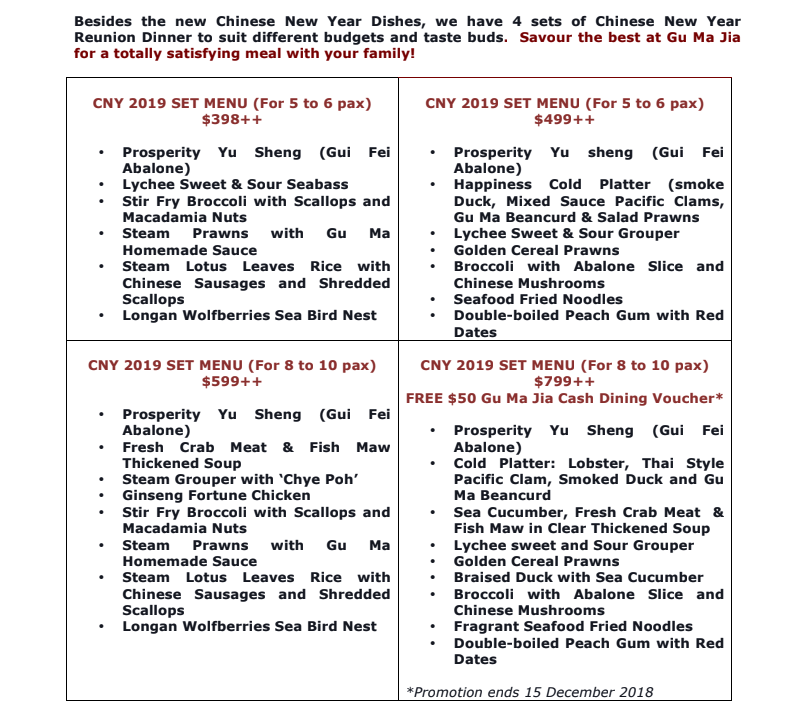 Gu Ma Jia does not only cook up hearty CNY dinners, but also provides catering services for birthdays, events and celebrations! Feel free to contact them to get any questions answered. Or, you know, just drop by for a simple meal here with their affordable lunch sets.